Right: The WIMM One, wearable computer powered by Android. A smartwatch (or smart watch) is a computerized wristwatch with functionality that is enhanced beyond timekeeping. While early models can perform basic tasks, such as calculations, translations, and game-playing, modern smartwatches are effectively wearable computers. Many smartwatches run mobile apps, while a smaller number of models run a mobile operating system and function as portable media players, offering playback of FM radio, audio, and video files to the user via a Bluetooth headset. Some smartwatches models, also called watch phones, feature full mobile phone capability, and can make or answer phone calls. Some also have "sport watch" functionality with activity tracker features (also known as "fitness tracker") as seen in GPS watches made for Training, Diving, and Outdoor sports. Functions may include training programs (such as intervals), Lap times, speed display, GPS tracking unit, Route tracking, dive computer, heart rate monitor compatibility, Cadence sensor compatibility, and compatibility with sport transitions (as in triathlons). During the 1980s, Casio began to market a successful line of "computer watches", in addition to its calculator watches. Most notable was the Casio data bank series. Novelty "game watches", such as the Nelsonic game watches, were also produced by Casio and other companies. The RC-1000 Wrist Terminal was the first Seiko model to interface with a computer, and was released in 1984. It was compatible with most of the popular PCs of that time, including Apple II,II+ and IIe, the Commodore 64, IBM PC, NEC 8201, Tandy Color Computer, Model 1000, 1200, 2000 and TRS-80 Model I, III, 4 and 4p. The RC-20 Wrist Computer was released in 1985 under the joint brand name "Seiko Epson". It had a SMC84C00 8-bit Z-80 microprocessor; 8 KB of ROM and 2 KB of RAM. It had applications for scheduling, memos, and world time and a four-function calculator app. The dot-matrix LCD displayed 42×32 pixels, and more importantly, was touch-sensitive. Like the RC-1000, it could be connected to a personal computer, in this case through a proprietary cable. It was also notable in that it could be programmed, although its small display and limited storage severely limited application development. The RC-4000 PC Data graph also released in 1985, was dubbed the "world's smallest computer terminal". It had 2 KB of storage. The RC-4500 (1985), also known as the Wrist Mac, had the same features as the RC-4000, but came in a variety of bright, flashy colors. In 1999, Samsung launched the world's first watch phone, the SPH-WP10. It had a protruding antenna, a monochrome LCD screen, and a 90-minutes of talk time with an integrated speaker and microphone. The first Linux Smartwatch was presented at IEEE ISSCC2000, 2000 February 7, where presenter Steve Mann was named "the father of wearable computing". 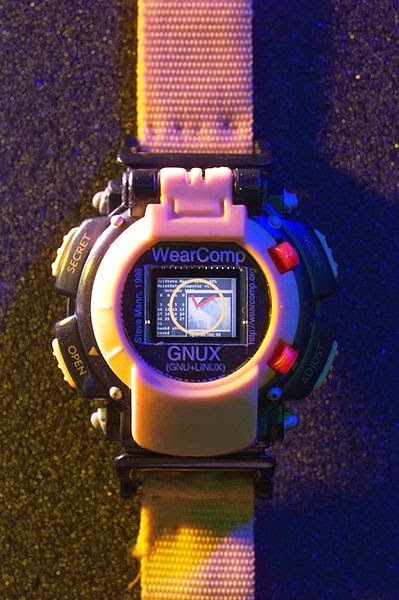 This Linux Smartwatch also appeared on the cover and was the feature article of LJ Issue 75. In 1998, Steve Mann invented, designed, and built the world's first Linux wristwatch which he presented at IEEE ISSCC2000, 2000 February 7, where he was named "the father of wearable computing". See also Linux Journal, where Mann's Linux wristwatch appeared on the cover and was the feature article of LJ Issue 75. In June 2000, IBM displayed a prototype for a wristwatch that ran Linux. The original version had only 6 hours of battery life, which was later extended to 12. It featured 8MB of memory and ran Linux 2.2. The device was later upgraded with an accelerometer, vibrating mechanism, and fingerprint sensor. IBM began to collaborate with Citizen Watch Co. to create the "WatchPad". The WatchPad 1.5 features 320 × 240 QVGA display and runs Linux 2.4. It also features calendar software, Bluetooth, 8 MB of RAM and 16 MB of flash memory. Citizen was hoping to market the watch to students and businessmen, with a retail price of around $399. However, the project was discontinued sometime around 2001–2002. The Fossil Wrist PDA, running Palm OS c.2003. American-based watch company Fossil, Inc. released its Fossil Wrist PDA running Palm OS. Microsoft releases the SPOT smartwatch. SPOT stands for Smart Personal Objects Technology, an initiative by Microsoft to personalize household electronics and other everyday gadgets. The watch was supposed to offer information at a glance where other devices would have required more immersion and interaction. The SPOT Watch had a monochrome 90×126 pixel screen. In 2009, Samsung launched the S9110 Watch Phone which featured a 1.76-inch color LCD display and was 11.98 millimeters thin. Consumer device analyst Avi Greengart, from research firm Current Analysis, suggested that 2013 may be the "year of the smartwatch", as "the components have gotten small enough and cheap enough" and many consumers own smartphones that are compatible with a wearable device. Wearable technology, such as Google Glass, may evolve into a business worth US$6 billion annually and a July 2013 media report revealed that the majority of major consumer electronics manufacturers were undertaking work on a smartwatch device at the time of publication. The retail price of a smartwatch could be over US$300, plus data charges, while the minimum cost of smartphone-linked devices may be US$100. The physical size of smartwatches is likely to be large. Insufficient battery life is an ongoing problem for smartwatch developers, as the battery life of devices at the time of publication was three to four days and this is likely to be reduced if further functions are added. New display technologies will be invented as a result of smartwatch research. The success level of smartwatches is unpredictable, as they may follow a similar trajectory to netbooks, or they may fulfil aims akin to those of Google Glass, another wearable electronic product. Acer's S.T. Liew stated in an interview with British gadget website Pocket-Lint, "... I think every consumer company should be looking at wearable. Wearable isn’t new … it just hasn’t exploded in the way that it should. But the opportunity’s for billions of dollars’ worth of industry." As of September 4, 2013, three new smartwatches have been launched: the Samsung Galaxy Gear, Sony SmartWatch 2, and the Qualcomm Toq. PHTL, a company based in Dallas, Texas, US, completed is crowd-funding process on the Kickstarter website for its HOT Watch smartwatch in early September 2013. PHTL explained that the purpose of its device is to enable users to leave their handsets in their pockets or bags, as the HOT Watch has a directional speaker for phone calls in both quiet and noisy environments. In a September 2013 interview, Pebble founder Eric Migicovsky stated that his company was not interested in any acquisition offers, but revealed in a November 2013 interview that his company has sold 190,000 of its smartwatch model, the majority of which were sold after its Kickstarter campaign closed. There’s clearly gonna be something that changes on your wrist, how it works and what exactly it is is something our teams are working on hard. Whatever it is, it has to compete with what works now ... We can’t have something fragile, we can’t have something that needs to be charged everyday. You’re going to have to have some functionality that’s just killer otherwise why spend the money on yet another product. At the 2014 Consumer Electronics Show a large number of new smartwatches were released from various companies such as Razer Inc, Archos, and several other companies, as well as a few startups. Some have begun to call the 2014 CES a "wrist revolution" because of the amount of smartwatches release and the huge amount of publicity they began to receive at the start of 2014. At Google I/O on June 25, 2014, the Android Wear platform was introduced and the LG G Watch and Samsung Gear Live were released. The Wear-based Moto 360 was announced by Motorola in 2014. At the end of July, Swatch's CEO Nick Hayek announced that they will launch a Swatch Touch with smartwatch technologies in 2015. The launch of Samsung's Gear S smartwatch was covered by the media in late August 2014. The model features a curved Super AMOLED display and a built-in 3G modem, with technology writer Darrell Etherington stating on the TechCrunch website, "we’re finally starting to see displays that wrap around the contours of the wrist, rather than sticking out as a traditional flat surface." The corporation will commence selling the Gear S smartwatch in October 2014 alongside the Gear Circle headset accessory. On September 9, 2014, Apple Inc. announced its first smartwatch called Apple Watch to be released in early 2015. As with other sport watches, the GPS tracking unit can be used to record historical data. For example, after the completion of a workout, data can be uploaded onto a computer or online to create a log of exercise activities for analysis. Some smart watches can serve as full GPS navigation devices, displaying maps and current coordinates. Users can "mark" their current location and then edit the entry's name and coordinates, which enables navigation to those new coordinates. Although most smartwatch models manufactured in the 21st century are completely functional as standalone products, many of the devices that are manufactured now are required to be paired with a mobile phone running the same operating system, this allows the watch to run not only as a watch but a remote to the phone. This allows the device to alert the user to communication data such as calls, SMS messages, emails, and calendar invites. While more are in production with current development, some companies are using popular outlets such as Kickstarter or Indiegogo to fund their projects. Last updated on 27 October 2014 at 13:16.